"Wacht! Euch zum Streit gefasset macht"
In the Düben Collection at Uppsala University Library there are 120 pages forming a monumentual work of which only parts exist and which does not carry the name of a composer. 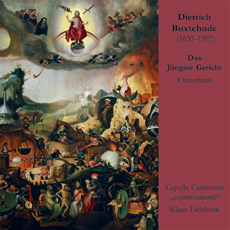 Today there is a general acceptance that Dietrich Buxtehude was the composer of the oratorio, but it remains impossible to prove beyond dispute. The difficulties in placing the work in a context may be one reason why this fascinating piece has remained in relative obscurity. This recording is an attempt to make the work available to a wider public for the first time.